No, Worthy Adversary isn’t the winter weather, it is Fulton Brewing’s winter seasonal, a Russian Imperial Stout. This big boy comes in at 10% ABV and is perfect for drinking this time of year, or perhaps a few winters from now. Worthy Adversary ages well, and would be a welcomed addition to any cellar or Brewbicle. 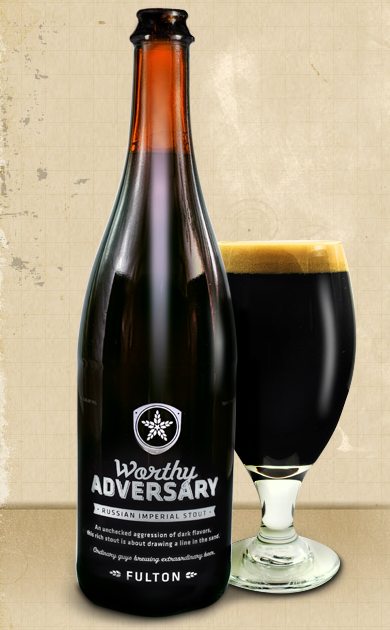 You can get your first taste of this year’s Worthy Adversary starting on Saturday at the Fulton Brewery Taproom. Begining at noon, growlers will be for sale ($18/fill) and the beer will be on tap ($5/12 oz pour).